The Aztec line of indoor-outdoor carpets mats and runners has a distinctive design using a chevron pattern to enable easier cleaning. It is constructed of 24-ounces-per-square-inch, heavy denier, solution-dyed polypropylene, which makes it a durable mat for all uses. 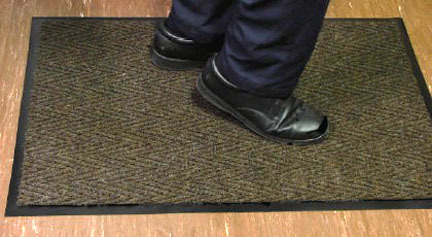 It is perfect for entrance-ways into banks, malls, churches,schools, industrial plants, hotels, hospitals, restaurants and offices - any place that demands a good floor mat. Cleans easily with a vacuum or sweeping with a damp broom. All mats and runners have vinyl edges. For prices and shipping charges on runners, contact U.S. Bank Supply, or if you desire a custom size. Phone: 805-218-6106 , or e-mail at orders@usbanksupply.com. The Aztec line of indoor-outdoor carpets mats and runners has a distinctive design using a chevron pattern to enable easier cleaning. It is constructed of 24-ounces-per-square-inch, heavy denier, solution-dyed polypropylene, which makes it a durable mat for all uses.